There are many toxins that your pets can be exposed to- even some things that are not dangerous to people can have profound effects on pets. Time Matters! If you think that your pet has been exposed to a potential toxin- DO NOT WAIT to see if symptoms develop- ACT FIRST. 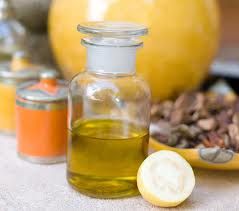 Many toxins, especially things which are ingested, have a small window of opportunity for effective therapy. If you wait to see if symptoms develop, you may have waited too long to really help your pet. If you can't reach your veterinarian right away- try contacting the local veterinary emergency room (Tri County Animal Emergency Clinic 309-672-1565) or you can contact the Pet Poison Helpline for instructions (855-886-7965). Most people know not to give alcoholic drinks to their pets; however, alcohol poisoning in pets is more common than you think! This is because alcohol can be found in surprising places. Rum-soaked fruitcake or unbaked dough containing yeast result in alcohol poisoning and other life-threatening problems. Unbaked bread dough will expand in the warm, moist environment of the stomach and can result i...n a bloated stomach (called “bloat”), which can then progress to a gastric-dilitation volvulus (GDV), which is a twisted stomach. Signs of GDV include vomiting, non-productive retching, a distended stomach, an elevated heart rate, weakness, collapse, and death. Secondly, when the yeast in the unbaked dough is fermented, it results in the production of carbon dioxide (causing the bloat) and alcohol. Alcohol from the fermenting yeast is rapidly absorbed into the bloodstream and results in alcohol poisoning quickly. Ingestion of alcohol can cause dangerous drops in blood sugar, blood pressure and body temperature. Intoxicated animals can experience seizures and respiratory failure. Stage 1: This occurs within 30 minutes to 12 hours, and looks similar to alcohol poisoning. Signs of walking drunk, drooling, vomiting, seizuring, and excessive thirst and urination may be seen. Stage 2: This occurs within 12-24 hours post-exposure, and clinical signs seen to “resolve” when in fact more severe internal injury is still occurring. Stage 3: In cats, this stage occurs 12-24 hours after ethylene glycol exposure. In dogs, this stage occurs 36-72 hours post-ingestion. During this stage, severe acute kidney failure is occuring. Signs of inappetance, lethargy, drooling, bad breath (secondary to kidney failure), coma, depression, vomiting, and seizures may be seen. In cats, the antidote must be administered within 3 hours of ingestion to be effective; after this time period, ethylene glycol poisoning is almost 100% fatal without hemodialysis. Aggressive therapy is necessary to survive. 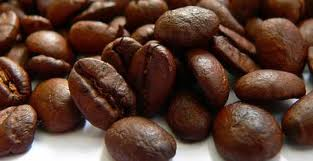 Coffee beans (especially candied) are sources of caffeine exposure. Various forms of chocolate - the darker the chocolate the higher risk of toxicity. An example of rodenticide blocks. 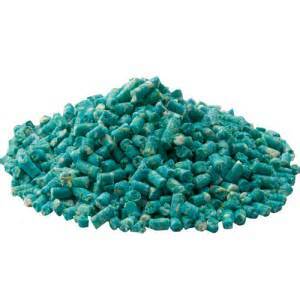 Rodenticide granules - be aware that the color or shape of a granule does not indicate an active ingredient- we need the product label to determine that! Humans continue to drink and use more and more caffeine, making pets more frequently exposed to this dangerous chemical. There are several sources of caffeine in the house: in coffee, coffee grounds, tea, soda, energy drinks, weightlifter supplements, OTC pills (e.g., NoDoz), and diet pills. Theobromine, a cousin chemical to caffeine is also found chocolate. Dogs and cats appear to be more sensiti...ve to the effects of caffeine than people. While 1-2 laps of coffee, tea or soda will not contain enough caffeine to cause poisoning in most pets, the ingestion of moderate amounts of coffee grounds, tea bags or 1-2 diet pills can easily cause death in small dogs or cats. When ingested, clinical signs of hyperactivity, restlessness, vomiting, an elevated heart rate, elevated blood pressure, abnormal heart rhythms, tremors, elevated body temperature, seizures, collapse and death may be seen. While the occasional chocolate chip within one cookie may not be an issue, we worry about certain types of chocolate – the less sweet and the darker the chocolate, the more toxic it is to your pet. Baker’s chocolate and dark chocolate pose the biggest problem. Other sources include chewable, flavored multi-vitamins, baked goods, or chocolate-covered espresso beans. The chemical toxicity is due to a methylxanthine (like theobromine), and results in vomiting, diarrhea, hyperactivity, inflammation of the pancreas (i.e., pancreatitis), an abnormal heart rhythm, seizures, and rarely, even death. In smaller dogs, even the wrappers from candy can result in a secondary obstruction in the stomach or intestines. Grapes, raisins, and even currants are toxic to your dog! In fact, there have been anecdotal reports of cats and ferrets being affected by these also. Ingestion of even a small amount of grapes, raisins, or currants can result in severe, acute kidney failure. All types of grape- or raisin-containing products (including grape juice, trail mix, bagels, etc.) can result in this. Even organic, pesticide-free, grapes grown in home gardens can result in toxicity. Although the mechanism of action is not clearly understood at this time, this common fruit can result in anorexia, vomiting, diarrhea, and potentially severe acute renal failure (which develops several days later). The toxicity is not necessarily dose-dependent, and symptoms can occur with even small ingestions. 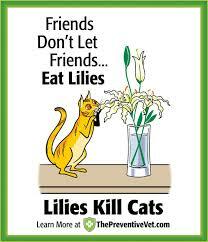 Lilies generally cause moderate to severe signs of toxicity when any part of the plant is ingested by cats. Common signs of toxicity include: loss of appetite, lethargy, hiding, vomiting, diarrhea, bad breath secondary to kidney failure, dehydration, excessive urination or thirst, seizures, and even death. Depending on the amount ingested, clinical signs of severe lethargy, increased body temperature, vomiting, tremors, joint stiffness, and inability to walk (commonly hind limb) may be seen. The toxic mechanism is unknown but can effect nerve function. As we prepare to winterize the house, keep in mind that rat baits can be very dangerous to your pet. If you place these baits, make sure to pick locations where your pet can’t reach them (remember that most of them taste good and that pets may go looking for them) Currently there are four separate categories of rodenticides available for general use. Each has a different and unique mechanism of action. This results in four different sets of clinical signs. All of these rodenticides also pose the potential for “relay toxicity”– in other words, if your dog eats a whole bunch of dead mice poisoned by rodenticides, they can get the secondary effects from this. •Long-acting anticoagulants (LAACs): By far the most well-known and perhaps most widely used rodenticides. This family of rodenticides works by causing internal bleeding and preventing the body from clotting normally. Common signs include coughing (blood in the lungs), vomiting, nose bleeds, bruised skin, weakness, bloody urine, bleeding from the gums, and inappetance. With LAACS, it takes days before the poison actually takes effect and before clinical signs of bleeding occur, but chronic ingestion shortens the time period. -Cholecalciferol (Vitamin D3): One of the most dangerous rat poisons out there is a Vitamin D3-based rodenticide. 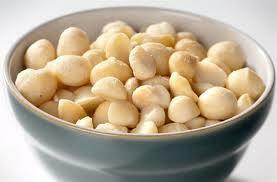 This type basically increases calcium blood levels so high that it causes a secondary kidney failure. With this type of rat poison, only a tiny amount needs to be ingested before it causes a problem, and long-term, expensive treatment is usually necessary. This is the type to avoid in your garage, as it has no antidote! •Bromethalin: This rarer type of rat poison doesn’t have an antidote and results in brain swelling. If toxic amounts are ingested, we see clinical signs of walking drunk, tremoring, and seizuring. Treatment is symptomatic and may require an extended amount of time in the veterinary hospital due to long-lasting effects (days up to a week). •Phosphides: This type of poison is more commonly seen in mole and gopher poison, and typically doesn’t come in the classic blue-green or yellow blocks or pellets. Phosphide rodenticides typically come in a poisoned “gummy worm” form that you put in the dirt. These types of phosphide poisons result in phosphine gas in the stomach, resulting in severe bloat, profuse vomiting, abdominal pain, and potential lung and heart complications. Like cholecalciferol poisons, it only takes a small amount of poison to cause a big problem! Make sure to keep these toxins away from your pets, as this type can be poisonous to you too (if you inhale the phosphine gas if your dog vomits!). NSAIDs are a class of medications commonly used in human and veterinary medication for a variety of reasons (ex. arthritis, pain relief, etc). These medications should be given under the direction of a veterinarian and please tell your veterinarian about any other meds that your pet is taking to help avoid drug interactions. Many of these human medications are toxic to pets- so please call your veterinary clinic before sharing meds with your furry friends. Signs of toxicity include: vomiting (sometimes with blood), diarrhea, black and tarry looking stools, loss of appetite, lethargy, inappropriate urination, excessive thirst, abdominal pain, seizures, and even death. There are veterinary specific NSAIDs (e.g., carprofen (Rimdayl), deracoxib (Deramaxx), meloxicam (Metacam), etc. ), which are generally less toxic to dogs than human NSAIDs (which can be extremely dangerous to pets). Examples of common human NSAIDs include ibuprofen (Motrin or Advil), naproxen sodium (Aleve), diclofenac, etc. 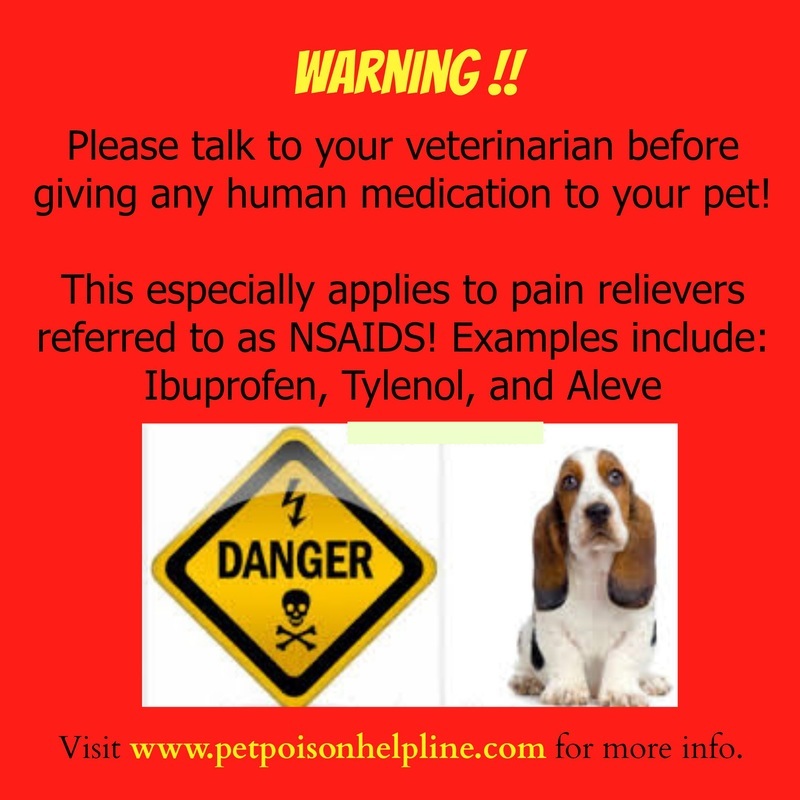 Any type of NSAID should never be given to your dog or cat without consultation with your veterinarian. 1. Ask your veterinarian which products would be safest for your individual pet and make sure you understand how to properly use or apply the medication. 2. Most modern packaging will say "DO NOT APPLY TO CATS" or has a symbol for no cats- they really mean it! Do not apply that product to your cat. These insecticidal products have very strict labeling that is controlled by the Environment Protection Agency (EPA). 3. 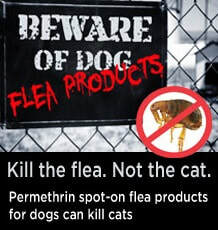 Keep your pets separated after all topical flea and tick applications until they dry. Many cats will groom the dog in the household or sleep with or on them and be accidentally exposed to the product. During the holidays, Poinsettias are a popular Christmas plant. 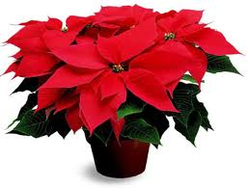 Though they have a bad rap, poinsettia (Euphorbia pulcherrima) plants are only mildly toxic to cats and dogs. The milky white sap found in poinsettias contains chemicals called diterpenoid euphorbol esters and saponin-like detergents. 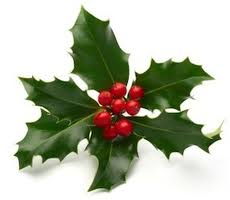 While poinsettias are commonly “hyped” as poisonous plants, they rarely are, and the poisoning is greatly exaggerated. When ingested, mild signs of vomiting, drooling, or rarely, diarrhea may be seen. If the milky sap is exposed to skin, dermal irritation (including redness, swelling, and itchiness) may develop. Signs are self-limiting and generally don’t require medical treatment unless severe. Salt, while commonly used for cooking in the kitchen, is quite poisonous to dogs and cats. The use of salt to induce vomiting in dogs and cats is no longer the standard of care and is not recommended for use by pet owners or veterinarians! Other sources of salt can be found throughout the household: in homemade play dough, rock salt (for de-icers), paint balls, table salt, sea water, etc. Salt poisoning in dogs and cats results in clinical signs of vomiting, diarrhea, inappetance, lethargy, walking drunk, abnormal fluid accumulation within the body, excessive thirst or urination, potential injury to the kidneys, tremors, seizures, coma, and even death when untreated. Xylitol is a natural, sugar-free sweetener commonly found in many chewing gums, mints, foods (e.g., pudding and gelatin snacks, etc. ), sugar free peanut butter, oral rinse, toothpastes, and supplements (e.g., sugar-free multivitamins, fish oils, etc.). The xylitol content of these products can vary widely depending on brand and flavor. 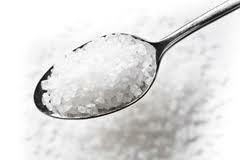 In dogs, xylitol ingestion can cause an acute, life-threatening low blood sugar (hypoglycemia) within 10-15 minutes. Large ingestions can result in acute liver necrosis and liver failure. Signs of xylitol poisoning in dogs include weakness, lethargy, collapse, vomiting, tremoring, seizures, jaundice, black-tarry stool, and even coma or death.